Log in to request review copies and download instructor resources. Log in to purchase, request an estimate, and manage your account. 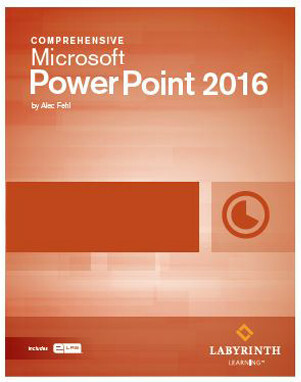 Microsoft® PowerPoint 2016: Level 3 provides thorough advanced training of PowerPoint 2016. This text provides more complex skills than those presented in our Level 1 and Level 2 books, but with the same proven instructional design. This is an advanced course that will challenge students. Topics introduced include presentation connection techniques, online collaboration, cloud computing, transporting presentations, and more. The text concludes with an integration lesson. This textbook is available in print or as an ebook accessible through any web browser and any mobile device. Our ebooks offer the same content as our print edition, plus direct links to any interactive content and other ebook features. When purchasing an ebook, you are purchasing a license key which will allow you to access the ebook through our partner, VitalSource for 12 months. Log-in or Register to preview book online and download extensive instructor resources. Pending approval. Once approved, you will be able to preview books online and download instructor resources. Most registrations are approved within 24 hours. Average Rating: 5 on 1 ratings. Item not rated. Log-in to be the first.Be the first. Log-in to rate this item. All the Labyrinth products we currently use are great! Very user-friendly; with easy to follow, step-by-step instructions. This course will be a wonderful addition to what we already offer. Visit the Customer Self-Service Center to check the status of any order. Get an inside look at eLab or take an online workshop on a specific title. Gain access to our instructor resources. Review materials online with PDF files. Preview net(discounted) pricing and view your order history. Students use this to purchase materials. Save your data for future orders. $1.99 Student shipping per item on most orders. This category is reserved for bookstore purchasing agents or resellers.